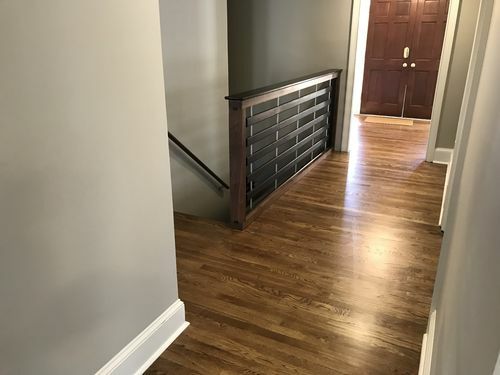 Just finished making and installing this stair railing that is made of Wenge,Walnut, and aluminum. 40.5 inches tall by 105 inches long. The 4.5 inch additional height over the 36 inch typical really makes it feel it has more of a dominant presence in the room. The Walnut beams are 4.25 inches wide by 2.5 inches thick. 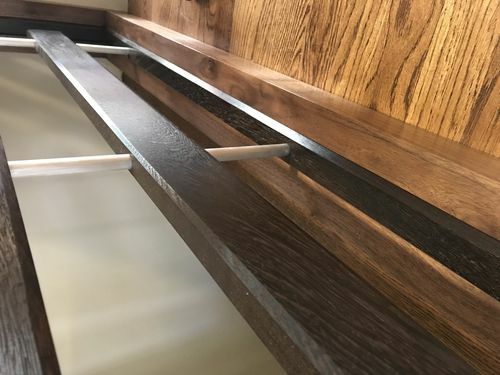 I put Wenge keys in The end posts and ran dadoes the full length of the Internal perimeter, which gave me a place to hide all the attaching hardware. I filled the Dadoed internal periemeter with Wenge that is chamfered and 3/8” proud of the Walnut surface. There is no wonkiness anywhere despite how light and airy it looks. This was a heavy project so I had a close friend Sebastian help me with construction and installation. Its the negative space design style that I enjoy so much! Lots of fun, thanks for the opportunity Cory..and now for the sofa table!! Wow, that’s great work and a very nice design….Outstanding. 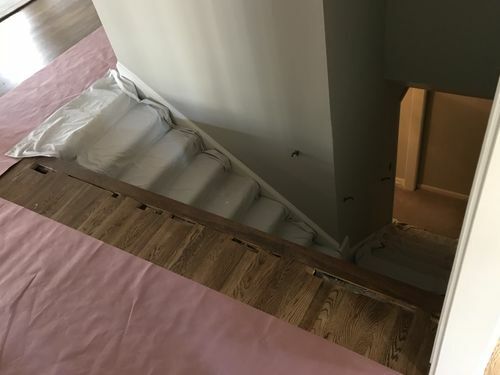 I wonder if someone is going to eventually hook a jacket or purse strap or something else on the open end of the horizontal slats on the way down…......then be stopped like a dog on the end of its leash. Would be pretty difficult to do but I am capable of doing foolish things like that. Jamie, that is very creative and nicely done. Now THAT’S a Railing! Well done Jamie! Very nice, Jaime. Where do you get your lumber? Peachstate Lumber in Kennesaw. Seem to have a good selection of what I like, good service, and better than most prices. They also don’t seem to find a way to magically turn 6 board feet into 8. Love those guys! Very cool – I really like the look. Is the aluminum simply seated in a hole, or is it captured on the back end and tightend? Curious to know if it’s actually part of the structural integrity, or not. Nice job! Very cool – I really like the look. Is the aluminum simply seated in a hole, or is it captured on the back end and tightend? Curious to know if it s actually part of the structural integrity, or not. Nice job! I Bought 1/2” hollow aluminum tubing from home depot and sanded with 320. It was then cut into very precise spacers. So it is captured on the backend as you say. 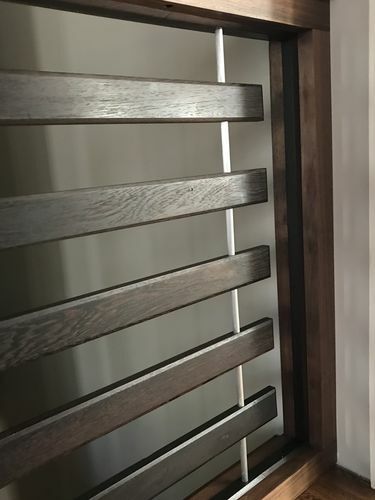 Drilled 3/8” inch holes in wenge slats and ran 3/8” threaded rod through Walnut, tubing, and slats from top to bottom. The 3/8” threaded rod fit perfectly inside the 1/2” hollow tubing preventing side drift and keeping it perfectly lined up. I used nylon lock nuts with washers on both ends to tighten it all together. By easily removing Wenge top it can all be tightened if ever necessary. The drill press got a huge workout during the project… which is all covered up of course. Beautiful work! I love Wenge. That looks very nice & contemporary. I wish I could do something like that but the kids would see a ladder up to the railing. I’ll have to check out Peachstate Lumber the next time I visit my brother in Powder Springs.